Download SlimDrivers Free, It is the latest version from Slim Ware Utilities. 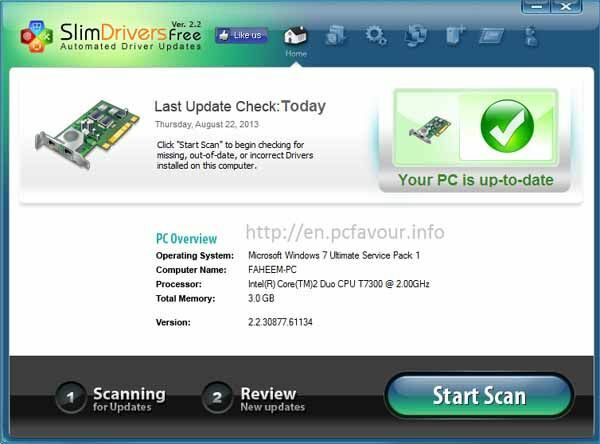 SlimDrivers Free lets you to automatic update your system all drivers. If you are tired of updating and searching your compatible latest drivers then SlimDrivers Free is the perfect and absolute choice for your computer system. SlimDrivers Free supports all version of Windows Operating system such as XP, Windows 7 and Windows 8. The menu of SlimDrivers Free has Home, Uninstall, Options, Restore, Backup, Submit and Support tabs. When you will start the program it will automatically detect the information of your system such as Operating System, Computer Name, Processor and Total Memory. These details will show on the Home tab of SlimDrivers Free interface. To check your drivers either they are up-to-date or not you have to click on “Start Scan”. This will start scanning and tell you the result that how many drivers are out-dated. The details will be show into group of category such as System Drivers, Network Adapter and Display Adapters etc. You will also see the currently installed driver date and available updated driver’s date. To update the driver, click on Download update and the program will start to download the update of that driver. This will install and update the all drivers into that category. From options tab, you can change general settings, backup, restore, update and schedule settings. You can set the location of backup files as well as restore files location. Update tab has the option to set the retry time if the connection has timed out. You can set a schedule time table for automatic check for update. If you want to manually restore or backup you drivers then you have to use Restore and Backup tabs. From there you can select the driver(s) that you want to restore or backup.